When speaking of Italian heavy metal, the first band that comes to mind seems to be more often than not Rhapsody. Once you start checking the history books, it becomes clear that Eldritch started even a little bit earlier, and even though they may not be so high on profile, they have been releasing a lot of high quality music in the last dozen years, with Neighbourhell being their already sixth longplayer. 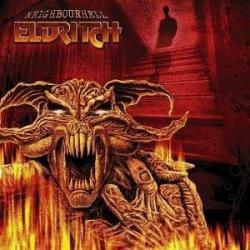 If anything has changed, Eldritch may have become even a bit harder, with the music eyeing flirtatiously with thrash metal while Terrence Holler still hollers in his melodic power metal voice. At times, and as a matter of fact rather often, Eldritch display their infatuation with progressive metal, so that they come across like the more compact cousins of Dream Theater. In fact Eldritch seldom need more than five minutes to play a song, and why not, as this brings a welcome freshness to their music. Melodic power thrash songs (Save Me, The Dark Inside, More Than Marylin) prevail, but the few more grating tracks (Come To Life, for instance) give the album enough variety. Eleven songs in three quarters of an hour (or if you have the limited edition, two bonus tracks including a Faith No More cover version) doesn't make Neighbourhell the longest album you could expect, but in the end you get the impression that anything more wouldn't have added any value to this already exquisite power thrash album.